1. Through DNA computation, one could do the parallel nature of computation as in DNA. 2. 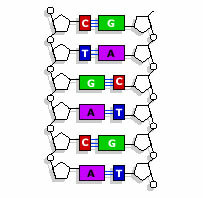 DNA computation is useful at the molecular level on the lines of nanocomputing for storage of large quantity of data which is not possible using semiconductor. 3. DNA computing reveals the data structure of DNA which is not seen in other biological molecules. 4. DNA computing can be used to solve many computational problems usually appear in cell based computational systems for cancer therapy. DNA or DeoxyRibo Nucleic Acid is the hereditary material of all organisms except a few viruses. It has two anti-parallel strands made up of Oligonucleotides. The strands are twined around each other forming a spirally coiled ladder. 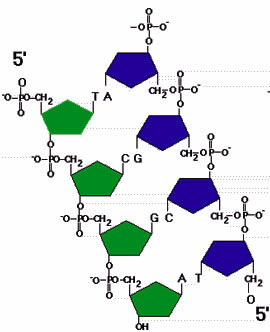 Each oligonucleotide strand has many nucleotides composed of a Nitrogen base, a DeoxyRibose sugar and a phosphate. The two anti parallel strands are connected together by hydrogen bonds. DNA molecules through DNA replication, dissociation and re-association when exposed to heat are highly specific and accurate. Moreover DNA carries thousands of genetic informations in the form of Genetic codes. These properties can be successfully exploited to do the computational systems. DNA code represents the Oligonucleotide sequences The selection of DNA code is a complex problem since the DNA exists in its secondary structure .To predict the secondary structure of DNA, Nussinoy – Jacobson algorithm is used . It also helps to identify the design criteria that reduce the possibility of secondary structure formation in the code word. The construction of codes includes reversible extended Goppa codes, Hadamard matrices etc. The DNA code is a set of sequences over the alphabet. Each Purine base (Adenine, Guanine) in the DNA is a complement of the Pyrimidine base (Cytosine, Thymine).The paring of A-G and C-T is very strong and stable. 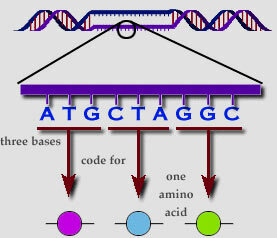 The DNA code construction involves construction of large sets of DNA codes with minimum distance properties.